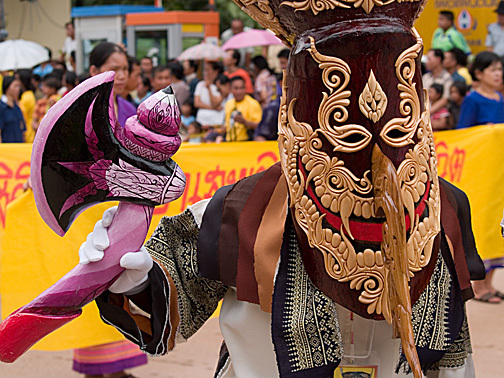 The Phi Ta Khon festival is unique to the Dan Sai district in Loei Province and reflects the local Isan belief in ghosts and spirits. Held once a year, it is part of a grand merit-making festival known as the "Boon Luang" festival. The origins of the Phi Ta Khon Festival can be found in the tale of Lord Buddha's last great incarnation before attaining Enlightenment. In Buddhist accounts, it is said that when Prince Vessandara, the Buddha's penultimate incarnation, returned to his city, it was such a joyous occasion that the village spirits came forth to join the welcoming parade. This very colourful and vibrant Phi Ta Khon procession is the central focus of the celebrations. In a lively re-enactment of the tale, the young men of the community dress up as "spirits" wearing long trailing costumes made from colourful strips of cloth sewn together. The hideous-looking Phi Ta Khon mask which is made of dried sticky rice husk is painted in bright red, green or other colours, and features the characteristic long pointed nose. This completes the transformation. The clanging sound of the square cowbells worn around the waist announces the presence of the spirits who wield phallic-shaped long-handled swords decorated with red paint. The good-natured, fun-loving spirits mingle among the crowd, teasing and amusing all who take part in the procession. Spectators and visitors are welcome to join in the fun. There are two types of "spirits" featured in the Phi Ta Khon procession namely the "Phi Ta Khon Yai" — the supreme Phi Ta Khon, and the "Phi Ta Khon Lek", the ones that are commonly found. The making of the Phi Ta Khon Yai involves the performance of a sacred ritual to seek the blessings of the supreme powers before work on the Phi Ta Khon Yai masks can be initiated. It is also a task reserved exclusively for the descendants of families in which the tradition of making Phi Ta Khon masks has been practised for several generations. The Phi Ta Khon Yai is made of bamboo and is dressed in either male or female attire.